Many guys will use bar soap to wash the face and call it a day. But why is skincare only applicable to women when we all share the biggest organ of the body: skin. True, male skin can be more resilient and tougher than the female counterpart, but that doesn't mean that we don't have the same skin issues like dehydration, acne breakouts, and oily areas. This guide will give you the basics to proper skincare. Male skin does have a few differences compared to that of females, but the differences can be negligible or vasty different depending on the individual; we will address the vast majority in general, but know that every person's skin concerns can often be different. Typical male skin is slightly thicker, more resilient, and it often has bigger pores (the tiny divots that you can visibly see on the nose, forehead, and underneath the eyes). What that means is that we typically can handle more physical stress (like scrubbing at the skin or scratching the skin) without noticeable effects, and can develop lines/wrinkles much more noticeably as we age due to our thicker skin texture (a good analogy is trying to smooth out folds from a sheet of paper, as opposed to a sheet of cardboard). Skin spans the entire body and even though you cannot see it, skin is covered with about 5 million pores (with 20,000 on the face alone). Under a microscope, pores look like a round trench, and they serve two purposes. Some pores house a hair follicle (where the hair grows out of), and all pores produce sebum (the oil your body produces to hydrate the skin). Acne/pimples occur when the pores are clogged with too much sebum/deadskin, and/or get infected with bacteria. Black heads (although not bumpy) are also a result of buildup in your pores. During puberty, the pores produce much more sebum, which can often cause more severe acne among teens. Proper cleansing, moisturizing, and protection can often minimize or eliminate acne breakouts. If you only use bar soap to wash your face and have no facial skincare, you are most likely dehydrating the pores of your skin. This can either cause your skin to be tight and really dry, or trigger your body to produce even more sebum then normal, which can lead to very oily skin or frequent acne breakouts. Using a non-drying facial cleanser, and hydrating with a facial moisturizer keeps the skin balanced with just the right amount of moisture it needs. Protecting the skin is also of utmost importance, and UV rays are the #1 cause for premature aging. A proper sunscreen will do more than any expensive skincare. If you are a lazy person, or just don't have the time to apply numerous skincare products to the face, the bare necessities you should have are a facial cleanser, facial moisturizer, and sunscreen. The cleanser is important to remove excess oil, dirt, and dead skin; and the moisturizer replenishes the skin with healthy moisture. Lastly, the sunscreen will block/absorb harmful UV rays from damaging your skin. 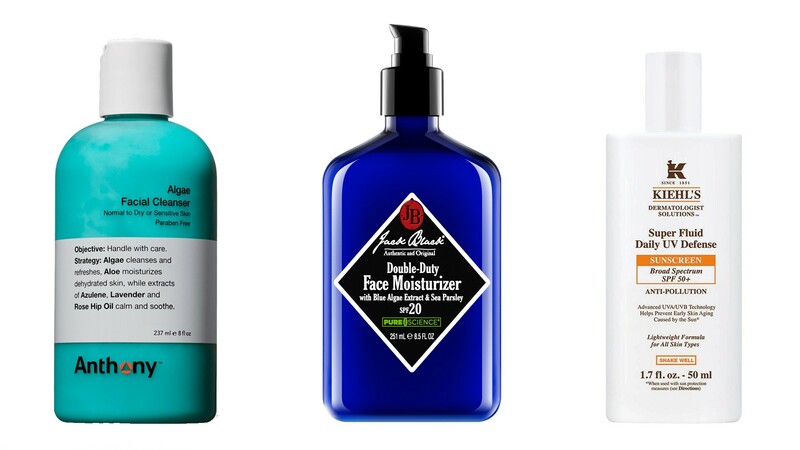 We cover this 3-step skin routine for all types of skin concerns. If your skin is oily from the time you wake up to the time you go to bed, then you have oily skin. Use an oil-free cleanser and moisturizer. This will keep your skin balanced without adding excess oils that your pores do not need. There are also cleansers and moisturizers that contain ingredients to remove excess oil from the skin, and some even trigger the pores to stop producing so much oil; these are typically marketed as "mattifying". If your skin is dry in the morning, but becomes shiny/oily towards the end of the day, you have dehydrated skin. This means that your skin is so dry in the morning that it overcompensates by producing excess sebum. You should try using moisturizing products (don't have to be oil-free) to balance out your skin's moisture. Your body will take up to 2 weeks to get used to the change, but over time you will notice that you no longer get oily/shiny towards the end of the day. If your skin is dry all day, sometimes even cracking or sensitive from being so dry, you have dry skin. Your pores are not producing enough sebum to hydrate the skin, so you need to supplement that with your cleanser/moisturizer. Choose a cream or oil cleanser because it will clean your skin while adding a little hydration to the skin at the same time. For moisturizer, pick one that is creamier or labelled with intense hydration to add more moisture into the face. It can also take 2 weeks for your skin to normalize (get used to the new routine), but you will start to see your skin look more supple and smooth. If your skin is easily irritated/red, reacts negatively to many of ingredients, or gets itchy/rashy from air-born particles, you have sensitive skin. Choose cleansers that don't create lots of suds/bubbles like cleansing milks, balms, and oils. These will help to remove dirt and excess sebum, but will not easily irritate your skin. For moisturizers, it doesn't matter if it's a cream or gel, but stick with a moisturizer that doesn't contain any exfoliating beads, enzymes, or AHA/BHA (acids that eat away dead surface skin) that may irritate your skin. Look out for cleansers/moisturizers containing chamomile, colloidal oatmeal, aloe, cucumber/cucumber seed, calendula (a type of flower), honey, or shea butter (shea is a nut), as these are all ingredients that are calming to the skin. If your skin is pretty normal with an occasional breakout, and doesn't get really oily or dry throughout the day, you have normal. You can use most cleansers and moisturizers, but avoid really thick creamy cleansers/moisturizers, as your skin doesn't need intense moisture. As for sunscreen, you might wonder why you have to use sunscreen everyday, even if you aren't going to the beach? Sun rays provide us with Vitamin D that is essential for the body, but sunlight also contains UV rays that damage our skin. UV rays penetrate through clouds and are amplified by water and snow. So even on a cloudy day, your skin is continuously getting damaged by UV rays without you even knowing it! UV rays contain of UVA and UVB rays. UVA rays penetrate and damage the deepest layers of our skin to potentially cause pre-mature aging (known as photoaging). UVB rays burn the upper superficial layers of the skin, and play a key role in the development in skin cancer. Sunscreen comes in 2 forms: physical sunscreen and chemical sunscreen. They work very differently, but essentially do the same thing: block UV rays from damaging your skin. Physical sunscreens (sometimes called mineral sunscreen) use active mineral ingredients (like titanium dioxide or zinc oxide), and it sits on top of your skin to reflect sun rays from your skin. Chemical sunscreens use organic ingredients (like avobenzone or oxybenzone) that get absorbed into the skin. Chemical sunscreens work by absorbing UV rays to produce heat that is then released into the air. One thing to keep in mind is that physical sunscreens often create a white cast on the skin and may not be suitable for deeper skin tones. Based on scientific studies, both types are safe for use on your skin, and neither have adverse effects on your skin, but our recommendation is to choose the sunscreen that you feel most comfortable on your skin. We recommend letting your sunscreen dry down on top of the skin to create an active barrier before stepping into sunlight. It is also recommended by Health Canada to reapply sunscreen every 2 hours because frequent moving/sweating of your face and skin creates cracks/holes in the sunscreen barrier for UV rays to damage the skin. If you would like to give a little extra TLC to your skin, we have listed products that you can easily add to your 3-step skin routine. BENEFIT: think of a serum as a supercharged concentrated product that will deliver results faster. There are different serums that target many different skin concerns; we will highlight the most common. Vitamin C Serum - Vitamin C is not only good to ingest, but is also good to apply to the skin. Vitamin C has been proven to brighten the tone of the skin, tighten pores, and fade scars/dark spots/hyperpigmentation. Apply a thin film all over the face avoiding the eye contours. You should generally see visible signs of improvement after 2 weeks. Hydration Serum - A hydration serum delivers intense moisture to the skin if your moisturizer is just not doing enough for you. The most common ingredients in hydration serums are hyaluronic acid and B5. Hyaluronic acid helps your skin cells to retain more moisture, which overall helps to keep your skin hydrated throughout the day. Vitamin B5 helps to hydrate, soothe, heal, and regenerate your skin cells. Talk to a skincare representative if you would like more details about how each ingredient of a particular serum benefits the skin. BENEFIT: removes dead surface skin to combat skin dullness, and clogged pores. Scrubs are more abrasive to the skin and contain granules (can be anything from fine sand, ground up fruit seeds, diamond powder, etc.) to scrape off dead skin and impurities from the healthy underlying skin. This should be used no more than twice a week (preferably with at least a 2 day gap in between uses). You will notice your skin feel brighter and smoother with continued use. Not recommended for sensitive and dry skin. We hope that we've shone some light about the importance of skincare, and that you have learned some valuable information on how to protect your skin. And if you are more curious, we invite you to do some of your own research!